For those of you who do not know me, my name is Emily Gordon, I come from the pretty village of Ilston although spend my weekdays as a trainee land agent in Pembrokeshire. I read welsh at university and having worked for HSBC bank and Swansea Cork Ferries in accounting, took a career change last year and decide to become a rural surveyor. In my spare time I am actively involved with my local church as PCC secretary, sidesperson and reader. I am an area representative with Three Counties and South Wales Flower Arrangers and enjoy travelling the country judging and competing in flower arranging. A few years ago I had the honour of representing the Royal Welsh Show as their lady ambassador and travelled the UK and Ireland promoting the show and welsh livestock and produce. In amongst all this I find the time to be secretary of the Gower Show and it is on that subject, the Gower Show, that I base my presentation this evening. I apologise that I do not have a slide show or video of the show for you to watch, I thought that on a warm evening the front row may fall asleep – although that might happen listening to me talk – who knows! When talking with a friend about what I could tell you about the show. He suggested that I may like to let you into the secrets of organising such an important part of Gower life. The show is steeped in history and I am sure that many of you in the audience are far better qualified to talk on the history of the show than I am. So, I thought I might share with you some of the challenges I face during the year. Might I emphasise that challenges are problems looked at positively, so really the show is not a problem, just a challenge. There were, at the end of the 19th century, two shows being held on Gower. The Gower Fat Stock Show was held just prior to Christmas and the Gower Flower Show in autumn. Many other fat stock shows across the country were quickly changing to being agricultural events. In this respect, Gower was late in establishing an agricultural show. The 1905 Fat Stock show recorded entries of a good standard with the introduction of classes for field crops, roots, corn and poultry. This marked the beginning of the Gower agricultural show as we now know it. The first Gower Show was held on 20th September, 1906 at land known as The Kittles at Penrice Home Farm. The show was a huge success with nearly £70 being taken on the gate. A little different to last Sunday. There were 541 entries recorded at the first show, double that of the last Fat Stock gathering. There were also classes for trotting, jumping, turn outs and dairy produce. The second show was held on 19th September, 1907 at Kilvrough and for the following few years the show alternated between Penrice and Kilvrough. The show was blessed with good weather in the first few years, a tradition which I am glad has remained until today. There have not been too many years days when bad weather has spoiled the event. The 1907 show saw the incorporation of classes for the tenant farmer with prizes including fertilizer, soap, teapots and biscuit barrels. I am not sure what last weekends winners would have made of a biscuit barrel as a prize! The total prize money awarded in the early days was £150. This barely covers the money given to the Supreme Horse Champion last Sunday. In the years 1908-1911 both entries and visitors to the show increased. Lady Blythswood had been appointed President and buses were noted bringing urban dwellers to the rural event. 1911 though was rather disappointing with livestock entries being lower in number than in previous years. 1914 however, was the last show for a few years as there were no shows held during the war period. The Gower Agricultural Society remained active, organising social events and presented £200 to war charities. The 10th Gower Show was held in 1919 and was a great success. The last show to be held at Kilvrough was staged in 1925, the same year that sheep dog trials appeared on the field. The 1926 show was described in the South Wales Daily Post as having a marquee containing the floral displays and the displays of fruit and vegetables sited near the castle. Today’s horticulture marquee is very much in a similar place. The main ring was near by and was surrounded by cars. Many families left early on show day to secure a pitch for their car alongside the ring. This was as much a social event for local people as a competition. Dad recalls my gran leaving Stembridge at 6am to get to the front row of the main ring. Health and Safety restrictions do not permit this tradition to continue. The 21st show was held in 1930 and in the following year the Glamorgan County Bee Keepers Association introduced a Honey tent. 1936 saw local industries and crafts being incorporated. There were displays of carpet making, basket weaving, pottery and wood turning. It was in this year that prize money had reached £400. The outbreak of the second world war and saw yet another break in the Gower Show history. 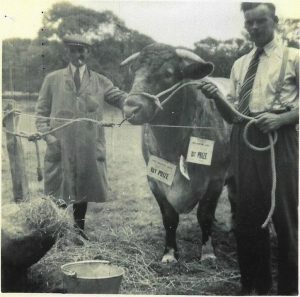 The 31st show was not held until 1946 and for several years following the show, (as we more recently have tried to do since returning to Penrice), returned to it’s roots and concentrated on stock and agricultural produce classes. As the years progressed, profits did not. 1949 saw a profit of only £10. This may well have been affected by the Royal Welsh Show being in town. It was in 1950 that Mr Alan Turnbull was appointed show director and has subsequently been followed by John Pritchard and now John Furneaux. The 1950’s and 60’s were a time of change. Variations were made to the livestock and horse classes and charities were permitted trade space. In 1958, following the death of Lady Blythswood, Mr Christopher Methuen Campbell became president and the date of the show was changed to the first Thursday in August. This was at the time when Swansea enjoyed half day opening only on a Thursday, with buses streaming to the show in the afternoon. 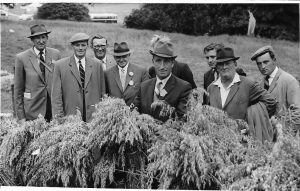 The 1960’s saw the start of a long association with the Young Farmers Clubs. Pennard YFC club was responsible for car parking and Three Crosses and South Gower for the stewarding and selling of catalogues. The next major change was the relocation of the show to Fairwood airport. There were a number of reasons behind the move and the show was held on the airfield for the next 14 years. The show survived various successes and disappointments while at Fairwood. The date of the show changed to the first Sunday of the month which didn’t go down too well with some people although it did appeal to the public at large. The venue was open to the elements and while the show grew in size, costs spiralled upward. Profits fell and losses were being made. Most importantly, for many as the show grew so it seemed to lack character and identity. The tragedies of the Foot and Mouth disease outbreaks caused the cancellation of the 2001 show, which was to have been my first in the post of society secretary. The restriction imposed by DEFRA, the government department for the environment, fisheries and rural affairs made it impossible to stage a show and the regulations have slackened little since. Shows are far from easy to stage. It was therefore amongst the difficulties of Foot and Mouth and with the excitement of moving back to Penrice that I was appointed show secretary. I had been involved with the Gower Show as a young child, competing in the children’s section arranging vases of wild flowers and making animals from odd shaped vegetables. However, when the show director approached me about becoming show secretary he did not warn me of the sleepless nights, endless phone calls, worry and panic that come with the job! On show day I occasionally pop my head out of the secretary’s tent for air, radio in one hand and mobile phone in the other. Although this year I did make it to the President’s lunch – all be it in 2 minute slots – my salad was awfully cold by the time I sat down! So, what happens behind the scenes, how does it all come together? What is the secret of the success of the show? Well, it’s a mixture of luck, experience, teamwork. For the average visitor, the show is a one day event held on the first Sunday in August. For me, and the other members of the team, it’s a one day event that takes 364 days to organise! Even Xmas day doesn’t pass without a comment about Gower Show! The show is very much a team effort and it simply would not be possible without the commitment of section secretaries, stewards, catalogue sellers, judges, exhibitors, car park attendants, tractor drivers, security staff and let’s not forget the litter pickers who clean the ground when the show is over. To enlighten you a little as to my role I thought I would read you extracts of my show diary. Anyway, there were the usual grumbles, but thankfully nothing too bad. The President’s lunch went ok this year – thank goodness. It’s not easy preparing and serving a three course meal in the middle of a field. The caterer does a great job. It was noted that the main ring timetable needed serious revision before next year. There were too many unhappy people after the last show. The ring ran very late, probably my fault for trying to pack too much in. The expertise and experience of the horse section secretary, main ring steward and show director would undoubtedly solve the timing problems. Amongst the jobs on the list to be done before the next meeting is to finish sending out the thank you letters – they always seem never ending, but it just shows how many people are involved in the running of the show. In the autumn, I’d like to be able to pack all Gower Show boxes away until the New Year, but with director’s meetings every month and the livestock meeting held in October access is needed to the files at all times. There was a good turn out of cattle and sheep boys at the livestock meeting in October, but as always there is the need for some more horse section representatives on the committee. It is the same story each year, trying hard to find a few more experienced helpers to make life easier in organising the schedule and getting stewards. In the meeting there was also much debate over the introduction of new sheep classes. The Texels were given a section of their own and a new open class was introduced for young handlers. It’s in October that the livestock and horse section judges are contacted. Thankfully, the livestock section organise their own judges but it is my responsibility to contact judges for the horse section, growing crops, roots and trade stand classes. Many judges are booked well in advance but the first round of invitations are sent in the hope that the judges are available. It is during October that letters are sent to the security firm in Carmarthen. It was decided at the last meeting that extra cover was needed at Oxwich Towers and the Castle ruins. The rosette and prize card order is also submitted to the company in Aberystwyth. Each section secretary usually provides me with a list of their stationery requirements and as soon as they are all back the main order is calculated and sent off. The order usually comprises of nearly 600 rosettes, 2000 prize cards, class numbers, car passes, badges, sashes, judges books, entry books – which all adds up and is a large hidden cost. The order is checked and checked again before being sent off to avoid and omissions. The badges are delivered before the end of March so they can be counted and prepared for the AGM. The rosettes are delivered by mid July, just before the Royal Welsh so that they too can be distributed to each section in plenty of time. The sound equipment placed with Rees Sound in Carmarthen is yet another large cost. Speakers are needed for the main ring, second ring, show jumping, horse lines and with the need to be in contact with so many people on show day – such as the show director, main ring, commentary box, first aid, vet, main gates, police, car parks, security and finance quite a few radios are needed. Contact is made with the first aid team and the vets so that they book the date into their diaries. The first aid usually require a site meeting to prepare their action plans. The horse societies applications are submitted in late autumn. ‘These are most important as we can’t have the Cob boys looking for medal cards or points. They are a breed of their own! But the cobs are fantastic running out, it is quite a sight seeing the display of stallions parading around the ring. We receive a number of letters each year asking the committee to offer classes as qualifiers for national championships, this year there was a new driving competition. It is a committee decision as to whether these classes are offered but they always create so much paperwork they are somewhat of a headache! By the end of November most judges have replied to the invitations – there’s always one or two to chase up. This time it was unfortunate that the arab and hunter judges were not available and so the committee needed to meet again to appoint further judges. Neither the sound firm or the vet had replied by the end of November so another call was needed to chase them. Attwools, the marquee firm are also contacted in November and are asked to forward a quotation. The committee was also waiting for a quote for the re surfacing of the road through the park. It is expected to cost in excess of £10,000 which would knock our accounts considerably. It was decided that it’s quite an outlay in one go. Further talks are needed with the estate to negotiate a tenancy agreement before agreeing to the road surfacing. Before Christmas letters are sent off to the Sheep and Goat Health Scheme, British Cattle Movement Service and DEFRA asking for the 2004 show packs. Each organisation needs a plan of the show ground and so it helps if the committee have confirmed the show layout. It was decided at a past meeting that the livestock area would move to the other side of the road, giving the animals a bigger judging area and penning area. The public are encouraged to remain out of the animal area until after judging and exhibitors are reminded of the movement restrictions on animals and the licenses and passports required on entry to the show field. At this time of year I attend a show secretary’s seminar in Builth. Secretaries from all over Wales meet to receive information and discuss the challenges of organising a show. Other shows seem to have the same problems as the Gower Show in tracing trophies. Having been shopping for the Christmas turkey, I was reminded that it was time to start thinking about the show dinner too. The dinner was held in March but it was a few months before the planning of organising the guest speaker, tickets, table centres, raffle prizes takes place. As usual the New Year’s resolutions include learning to say No, learning to delegate and be more organised. The more intricate parts of the show become a priority at this time of year – the portable toilets for example are booked. The marquee quote arrives in January. The cost goes up every year and there is always the addition of insurance cover – but you’ve got to have it. An order was placed for the purchase of cones to divide the main ring. They are far easier to move should different sections need more space. The cobs need a good run out as do the hunter classes. The main ring stewards move them as they see fit on the day. The members’ newsletter took shape in February, although as with most other things articles were thin on the ground. It was hoped that the newsletter would attract new sponors and entries. A recipe for the cookery section had been included. It was unfortunate this year that the Gower Show clashed with the Shrewsbury show and Hereford festival and so the usual commentary team was unavailable. The schedules slowly took shape. There were a few new classes in the livestock and horse sections and it was hoped that they would get the support they deserved. The committee is always looking for improvements to the show, but space is a problem. When entries increase there’s the headache of parking lorries and boxes but the men responsible for the lorry parking do a super job and manage to fit everyone in each year. There are so many unseen people who make the show work. The lorry parking stewards and car parking stewards are amongst these people. All other sections tick along quietly at this time of year. Each section, such as poultry, vintage, cookery and honey has its own secretary and their judges, schedules and stewards are all appointed within their own committees. The first dinner to be held for some time took place in March of this year. There were just over 80 guests. The meal at The King Arthur was super, the guest speaker went down well and so there were just the monies to be balanced at the end of the day. Assistance was sought for the counting of monies on show day. It is a great help to the treasurer as a lot of money is handled in one day and needs counting, recording and preparing for the securicor collection. The AGM is also held in March, on the last Thursday of the month. There were one or two new faces which is encouraging although more people are always welcome. It was decided to keep entry and membership prices at the same level as last year. The show is still a good value day out for a family at £12. Following the acceptance of any recommendations and changes of officers at the AGM the schedules were sent to the printers at the end of the month. Collectors’ packs are also put together. Each collector has badges, car passes, record book and newsletters. Time was flying by and the start of the show season was not far away. The service of blessing, which was held on the show field last year, was a success and it had been agreed to repeat it again. The vicar of Llanrhidian had agreed to lead the service and organise hymns and readings. There was still the need to arrange readers, hymn sheets, flowers and refreshments. The show chairman is responsible for the tea served after the blessing service. Despite being written to, the donkey rides usually just turn up. It is from April on that trade stand enquiries start coming in. Trade stands are a real head ache and thank goodness the responsibility of organising these lies with the show director, along with the fair, craft marquee and food hall. Demand far outweighs the supply of trade space available on the show field. But, it is important to have a balance of traders. ‘Everyone wants the best spot with flat ground, electricity and water – just not possible in a field! By the end of the month, contact is also made with suppliers such as Brisco who provide a skip and gas boilers for teas. Gas lamps are no longer needed as the horticultural stands set up during the day time now. Brisco provide the goods free of charge as their sponsorship to the society. Sponsors are a big part of the show and their support, either financial or in kind, is greatly appreciated. Cothi Bridge and Swansea Shows are held on Bank Holiday weekend in May and start the show season. After numerous draft copies and alterations, the schedules were printed in time for Swansea show. Highlighted, in bold print this year, was the note that names and addresses of exhibitors will be printed in the show catalogue. Having followed the required procedures, it was annoying to discover in May that there was no space left to advertise the show on a banner on one of the bridges in Swansea. All bridge space has been booked internally. – not a problem – just another challenge. Details of the show are sent to the farming unions, What’s On magazine, Gower Church Magazine, Western Mail, Cardiff Advertiser, Swansea Sound and the Bay Festival in May. Along with 200 posters, tourist information centres and 1200 fliers the show is well advertised. The 1200 fliers were sent to the distribution company. The show director contacts a local firm who deliver the leaflets at a much cheaper rate than the post office. Areas such as Pennard, Southgate, Three Crosses, Gowerton, Killay and Tycoch are targeted as the society does not have collectors in those areas. The falconry display had not confirmed their attendance in June which caused a slight panic. The display is impressive and it is quite a spectacle in the main ring. His attendance at the show usually depends on him finding cover for his displays at Longleat. The Native American group that were at Swansea show had agreed to perform at Gower Show. They cost a few hundred pounds, but offer something a little different and perform in the second ring as well as having the tee pee village display. The second ring became a headache. Finding attractions to fill the ring all day (on a budget) isn’t easy. The Native Americans agreed to fill two slots, the vintage machinery display had agreed to go around twice and the Banwen Hunt would provide an impressive display in the second ring prior to going in to the main ring. The quad bike challenge worked well in the second ring last year – and had been given a 5 o’clock slot. I don’t know why I worry about the second ring when there’s the main ring to fill first! In the main ring, horse classes continue until 3pm. The grand parade must follow straight after the driving classes. So, the grand parade was scheduled for 3, the Banwen Hunt and Hounds at 3.30, the falconer at 4 and the vintage at 5 followed by the It’s a Knockout competition. The Fire Service usually provides water to fill the water pool. They are ever so good in helping out as are the coastguards. Both emergency services, whose staff are local people, attend the show and are situated near the main entrance as an easy get away point if need be. By June the prize monies are prepared. It can’t be easy sorting prize money for all the different sections but the lady who spends days in the bank preparing it seems to enjoy it! The money arrives at the show all enveloped and boxed ready which is an enormous help to the section secretaries. By the end of June all judges’ packs are sent out – it allows time to check that all is ok and for judges to come back with any queries. Each judge receives a schedule, badge, car pass, map and lunch voucher. ‘This year I popped a newsletter in too for good measure!’ – in the hope that they may become members next year! A major sigh of relief was taken in July following the news that DEFRA had approved our application for a show licence. Since the outbreaks of foot and mouth disease, all shows are run under strict regulations. Shows have to apply for a licence to hold a show where cloven hoofed animals will be present. The land needs to be fenced and clear of stock for 28 days prior to the show and I am most grateful to the estate staff at Penrice for making this possible. Disinfecting points are needed on entry and exit gates to the animal area and extra stewards are needed to check that animals are travelling on the correct passports. The vet needs to oversee unloading and stop any animal that looks suspicious from passing on any infection. The President’s lunch became another headache in July. No matter how clearly the letter with the invitation states that places will only be reserved for those who confirm their attendance I know people will just turn up and sponsors cannot be refused lunch. The guest list grew quite a lot in July. The main guests at the 04 show were the Mayor, the Lord Lieutenant, High Sheriff & Leader of the Council. The RAC signs are erected at Penllegaer roundabout towards the end of July which emphasises that the show is days away. A week at the Royal Welsh doesn’t help show planning. Anyway, having cleared twenty messages off the mobile and picked up messages from home and the office each day, the draft copy of the catalogue was collected from the printer on my return from the show. By this stage there’s not a lot left to do other than check lists and make more lists! And check the new lists again and again! And so the list goes on and I realise that next Monday it will all be over and I will be back in work! Posters and catalogues are collected from the printers the day before the show. The crops section is marked out and flower entries start arriving at 10am. Cookery is ready for judging at 2pm and Horticulture at 4pm. Trade stands arrive throughout the day and need directing to their spots. The tee pee village looked good and the sound system worked when tested. It was great to see so many new faces helping set up the show this year – teamwork is a wonderful thing. I left the show field at 9.15pm, raced to Tesco and then had 30 table centres to make for the President’s lunch and sandwiches for the boys and girls parking cars. Yes I am totally mad. I always hope to get a few hours in bed before getting to the show early on show day! I don’t feel as though I’ve had any sleep but according to the imprint on my pillow I must have been there at some point. We were stuck in traffic on the way to the show this morning. The queue started in Nicholston. Thankfully it was a tractor turning into a field that was the hold up and not show traffic – the police wouldn’t have been too happy at congestion at that time of day! The car park stewards were on duty early and I received a warm welcome to the show – I trust all other visitors received the same. The show ground was a hive of activity. There were people dropping off bales of hay in the crops competition, sheep being trimmed, horses being exercised and cars parking in the member’s field already. I ought to have been excited, but gosh did I feel unwell! I just worry too much. The livestock secretary was on her way to hospital having been kicked in the face by one of her own animals. But as they say no one is indispensable and a few others ably coped in her absence. All in all the day went well. The main ring ran without delay from 9am to 7pm. The second ring ran from 11m to 6pm and the Banwen Hunt came up trumps with a salute to the President’s lunch guests. It wasn’t quite as much fun getting the hounds to the ring though! There were a number of hiccups which will need to be reviewed before next year’s show, but these did not concern the general public. The show would not be the same if it all ran smoothly. 148 guests joined the President for lunch, 180 judges, stewards and volunteers were fed and watered, the vet had a few animals to deal with, first aid fixed a few wasp stings and an injured livestock secretary. In excess of 200 horses entered the main ring, there were 43 cattle exhibits, 176 sheep, 5 pigs and add in a few chickens, chocolate cakes, sticky buns, dahlias, cabbages, popstar potatoes, decorated coconuts, vintage cars, donkey rides, sticks, crafts, Native Americans dancers and hounds and it all makes for a great day out! I enjoyed a cold drink at the end of the day with my directors reflecting on yet another successful display of the finest of welsh livestock and produce available on our doorsteps. Back in 1906 £70 was taken on the gate and there were 541 entries on the field. The show has grown somewhat since then but its roots and aims remain the same and that is to provide an agricultural show, a celebration of country life. So, as I climbed into bed that night, I realised that I’d wake again the next day, God willing, and start all over again. It’s only 364 days to the next show – it will soon be here!